Book your hotel for the 2009 World Championships NOW! With the incredible excitement of the '08 World Championships still fresh in many people's minds, fans around the world have already started counting down the days until the start of the 2009 Drum Corps International World Championships – the first ever that will be staged in the spectacular new Lucas Oil Stadium in downtown Indianapolis from Aug. 6 - 8, 2009. Be among the first to reserve your hotel rooms for this historic championship event! Drum Corps International has reserved special blocks of rooms in many popular downtown Indianapolis hotel locations to put you right in the middle of all of the excitement and championship week festivities next August. Book now and lock in a great location and a great rate. With a dense concentration of hotels right in the downtown area, fans will not only be within short walking distance of the brand new Lucas Oil Stadium, they will be able to feel the aura of championship excitement like never before! You'll be front and center, right in the heart of everything that the Circle City has to offer in great dining, entertainment, cultural activities, and more, all wrapped up in one convenient location. Book your hotel rooms today with an easy to use online interface created especially for fans of Drum Corps International by the Indianapolis Convention and Visitors Association. There, you'll be able to search for available rooms, compare rates and amenities, and establish your "home base" for the 2009 DCI World Championships. 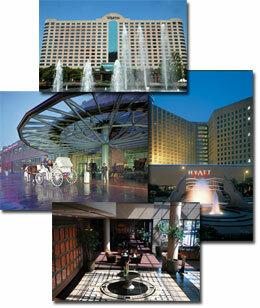 Reserve your Indianapolis hotel rooms today at DCI.org/IndyHotels. Learn more about buying tickets to the 2009 World Championships.